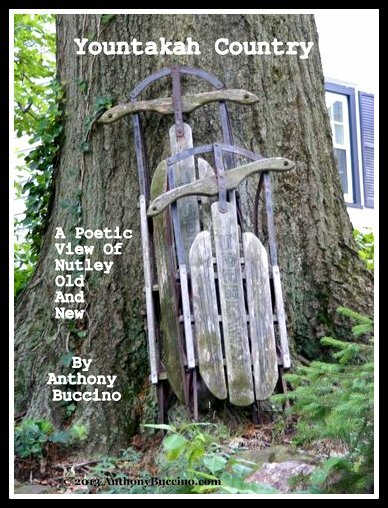 Buccino takes some history, some folk lore and some current news and mixes them together in this humorous and thoughtful collection about the little town of Nutley, N.J., on the Yountakah River. Buccino's take on the township mixes history, tales and observations in a rich mix of what may or may not be the true history of Annie Oakley, the ITT tower, Lenni Lenape or Valium, not to mention the Velodrome and the headless rider or the parlous waters that rage through Yountakah River on rainy days. Knowing some of Nutley's history, readers will appreciate the twists and turns and maybe even learn something about the quiet little "Norman Rockwell town" in northern New Jersey. For instance, did you know that the quiet little river that runs through Nutley was called Yountakah by Lenni Lenape, and so was their annual autumn feast - a predecessor to the Pilgrims' Thanksgiving? The name was also used by a large country club and golf course that bordered the Passaic River in town. Buccino's poetry collections are mostly out of print. Special orders - send email to author. Page 10, 15 – Brookline Ave. Photos by author, except as noted.